My [older younger sister](http://www.athenasbanquet.net/) is wicked and evil. I have great hopes for smiting her come Christmas. 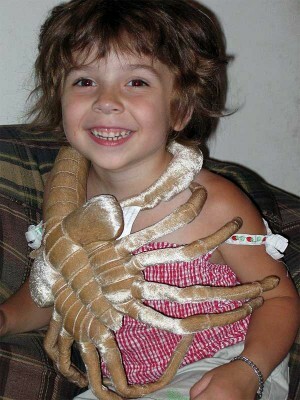 Rebecca is quite taken with the facehugger. Really. Hug it and squeeze it and call it George, indeed. This entry was posted in Live and tagged kids. Bookmark the permalink.